MESSENGERG2-Two-XL - 48 Loudspeakers - 6084 mm - 94 dB to 70 m.
ATEÏS introduces here next generation range of steerable line-arrays that are fully redesigned to meet the current and future demands for the Voice-Alarm industry, commercial audio and Pro-sound. The MESSENGERG2 is a through ‘next generation’ design where we have focused on an improvement on the lobe-controls and the overall technical specifications, we can now say that the MESSENGERg2 provides broadcast S/N ratio, music quality frequency respond and a pro-sound power handling with more advanced pre-processing abilities. New generation ATEÏS Voice-Alarm and audio processors are equipped with remote control facilities by LAN or WAN and have a variety of networking and control cards. To meet our future standards, the MESSENGERG2 has been equipped with equal networking facilities. The input section has been redesigned and upgraded to broadcast standards and has now 2 fully controllable audio inputs and outputs with override functions and hardware bypass function. The output to the slave unit’s caries either the pre-processed mixed signal of the input mix and thus provides easier room control as equalization and feedback filtering or the original ‘floor’- signal. Additional input-cards can be provided to have a digital link between Messengers or to interface with an ATEÏS network based on the M-Net™ or AteÏs-Net™ and can be controlled using the new ATEÏS Studio™ system designer and controller software. An optional Messenger-rack-controller (MRC), half size 1U/19 inch rack frame, facilitates 2 fully controllable audio inputs and two slave outputs, TCP-IP connection, RS485 and the digital networking M-Net™ to digital interface with the Messengers. The external interface is also ready to receive the instructions of the new ATEÏS Studio™ remote Control software. The MESSENGERG2 is designed to meet with the modern standards for Voice Evacuation and equipped with a dual-mode redundant power supply and redundant link between the Messengerg2 and the optional external MESSENGERg2 controller (MRC). M-Net™ Messenger nodes can be placed up to 100 m away. For longer distances a fiber-optic convertor is available. 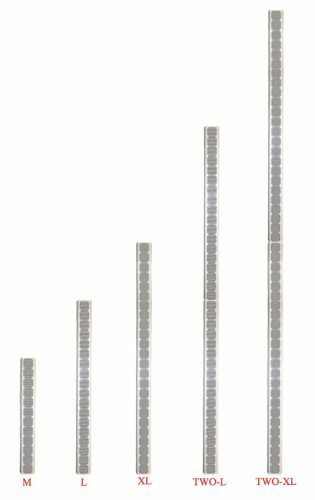 Each MESSENGERG2 array has a very tightly controlled beam, which can be shaped as required for specific applications or environments requiring symmetrical or asymmetrical, single, dual or triple lobe designs. The availability of high power audio DSP’s such as the analogue devices makes it possible to provide 24 channels of powerful processing that lead to precise beam control and even signal pattern that stays within 3 dB over a distance of 100 m.
The MESSENGERG2 range is completely software controlled, the variable acoustical centre can compensate for architectural requirements and can be easily adapted for specific types of application. Its flexible mounting height of between 1.2 and 4 m above ground level ensures the array can be securely positioned. 24 Class-D amplifier channels with 70 Watt each on AteÏs-Net communication bus. SPL coverage stays within 1dB variation. Power supply : EN 54-4 compliant.